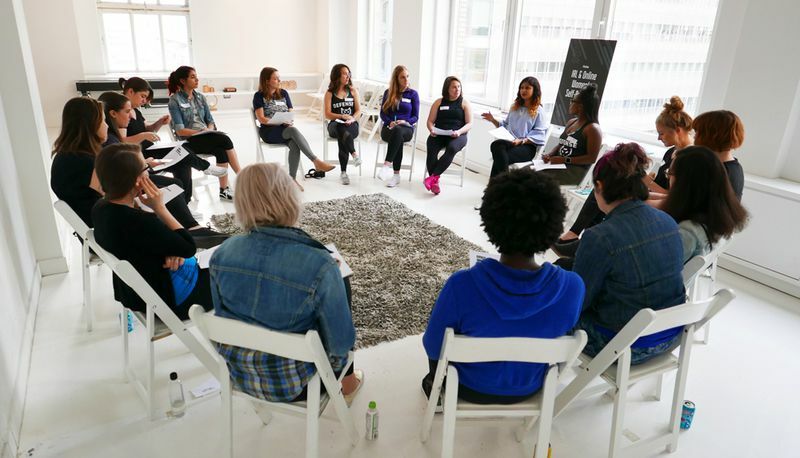 This curriculum was created for a Defend and Detox event for women in New York City to teach the digital women how to protect herself online. The curriculum can be adapted for women anywhere. 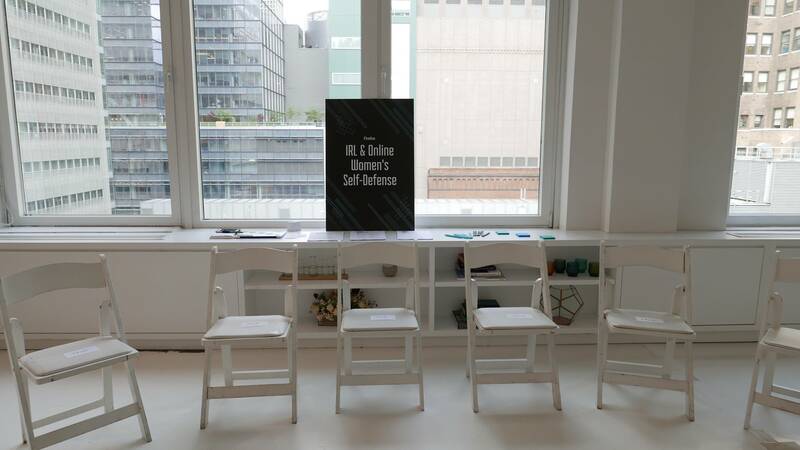 See a review of the event on The Verge. Understand the important of privacy and security online. Learn tips and tricks to protecting your self online. Getting Started. Before you begin please review these tips on creating safe and comfortable events for women and girls. As the facilitator, you want to make sure you create an open and comfortable space for sharing. Consider creating rules of conducts, sharing goals for the workshop, creating an opening agenda and setting the tone at the beggining of the event. Introducing myself and my background. Sharing why I care about privacy and my relationship to this work. Sharing why privacy is important, especially to women. Telling people we are going to be talking about privacy so only share details or stories that you are comfortable with. Encouraging people to ask questions, especially if they don't know terms. Remind people not to share sensitive information about their accounts. Using aliases or examples are okay. Ask people if they are comfortable if notes or pictures are being taken (if applicable). Now that you've created a safe space for sharing, let's get started with some activities. This is a remixed version of the classic game, True or False. Read one of the phrases below and ask attendees whether they think the phrase is true or false. You can have attendees say their response outloud OR you can prepare in advance two cue-cards per attendee that are marked 'true' and 'false'. Having cue-cards prepared allow all participants to guess before the answer is revealed and is recommended in a gender-specific group. Say one statement at a time. Ask attendees to guess the answer. Reveal the answer. Then explain the answer to the statement (sample responses are below). Encourage reflections and comments from attendees. Notes: You can click on the True/Falses after the statements to be taken to articles online with more detailed explanations. Women are more vulnerable online. TRUE. Women are one of the largest subjects of online harassment, attacks, bullying and stalking. Over 25% of women between the ages of 18-25 have been stalked online or were the target of online sexual harassment (compared to 7% of men who have been stalked online and 13% who were the target of online sexual harassment). Snapchat documents and archives every snap that is sent. FALSE. While Snapchat has comed under scrutiny in the past for secretly saving snaps, they have updated their terms to delete snaps after a certain time period. A time period which is not defined on their site. MAC computers don’t get viruses. FALSE. While they get them a lot less, MAC computers (and Apple) products do get viruses. They get them a lot less because they are a much smaller market share of global products which make them less attractive for large-scale virus attacks. All data we enter in an online purchase is encrypted – therefore it is safe. FALSE. Every company is vulnerable to an attack, even the most truthworthy of online sites. Many site that we regularly put our credit card info into have been hacked in the past. The verb doxing comes from the word ‘dox’ is a shortened version of the word ‘documents’. TRUE. Doxxing is when you research and share private or identifiable information (especially personally identifiable information) about an individual or organization. You are literally making a persons documents public. Splashdata says the most popular password in the world in 2015 is 123456. TRUE. The second is password, the third is 12345678. Even though people know it's an easy password it is continuously used often around the world. Facebook's Data Use Policy states that they will share your information if the government asks. TRUE. Facebook may access, preserve and share your information in response to a legal request (like a search warrant, court order or subpoena) if they have a 'good faith belief' that the law requires them to do so. 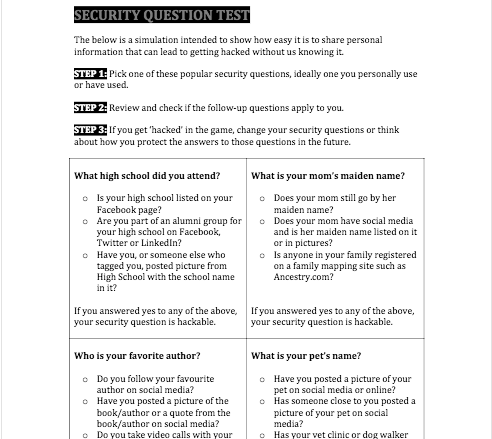 The Security Question Test is a simulation intended to show how easy it is to share personal information that can lead to getting hacked without us knowing it. Make sure you have enough tests for each attendee. Pass out the tests and talk attendees through the steps. Note: I usually ask attendees to only pick one of the security questions that resonates the most with them for both time reasons and because I assume they have not encountered them all online. STEP 1: Ask attendees to pick one of the popular security questions, ideally one they personally use or have used or is similar to one they have seen. How many people got 'hacked'? And if so, how did it make them feel? Will anyone change their answers online or modify them? Did the activity change how you will approach security questions in the future? How can you protect the answers to those questions in the future? 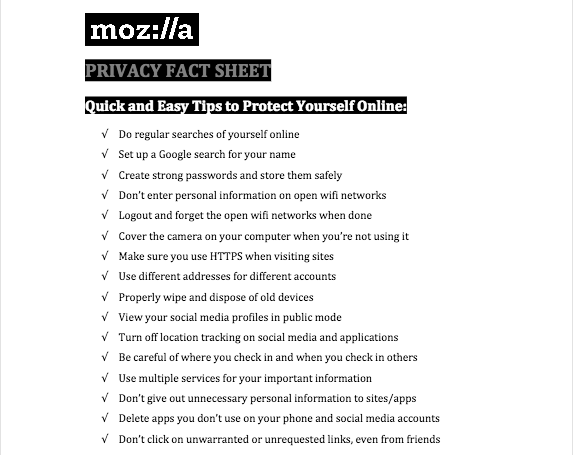 The privacy fact sheet is meant to give individuals an idea of easy steps they can take online to protect themselves. Hand out one fact sheet per person. Ask individuals to get into pairs and discuss with their partner which of the steps they follow and which ones they don't. Allow 5 minutes for discussion time. Afterwards ask the group to come back for a group discussion. If time permits, talk through each tip as a group and ask the group for examples as to why each one is important. How many of the easy privacy tips to you currently use? Aks how many use 5? 10? 15? Which tips will you start to use? Why? Are any of these tips more important than others? Are any of these tips new to you?